Winter Gem Boxwood provides a vibrant evergreen cover for your home landscape plantings. You can use this evergreen shrub as a backdrop for your perennial gardens. The colors of your flowering perennials will bounce off of the vibrant green foliage of Winter Gem Boxwood. This shrub does grow a little bit larger o give it 3-4 ft. spacing between plants. Annual trimming is a must to keep it the size and shape you desire. I think the largest I have seen this shrub grow to was about 5 ft. in height. (still not a bad size). 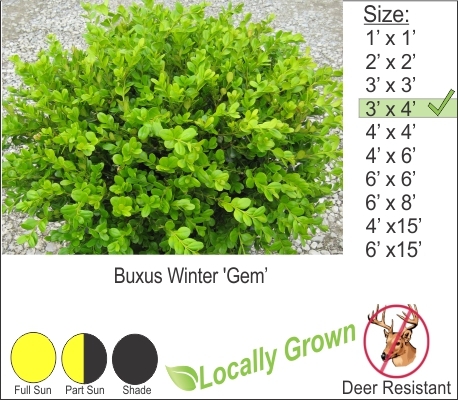 Like all boxwood this shrub is deer resistant too.